A common stepper motor is the four-coil unipolar. They are called unipolar because they require only that their coils be driven on and off. The stepping sequence for a four-coil unipolar steppers is shown below. If you run the stepping sequence forward, the stepper rotates clockwise; run it backward, and the stepper rotates counterclockwise. The motor’s speed depends on how fast the controller runs through the step sequence. 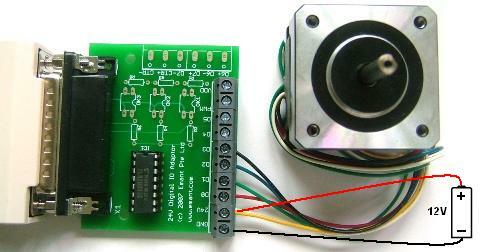 The stepper motor we used is the PF443-03A from Mycom. It requires a supply voltage of 12V and the coil current is 0.31A. Each step is 1.8 degrees. The EMANT300 digital output current drive is about 20mA - too low to drive the stepper motor coil. Besides, the Mycom PF443 stepper motor operates from a 12V supply which is higher than the 5V allowed for the EMANT300 digital output. Therefore, one simple solution is to add the ULN2003. The ULN2003 is a high voltage, high current darlington driver comprising seven NPN darlington pairs. All feature integral clamp diodes for switching inductive loads. The ULN2003 has a maximum sustaining output voltage of 50V and maximum output current of 0.5A per channel which easily meet the requirements of the Mycom PF443 stepper motor. Toggle Halt /Run switch to run.